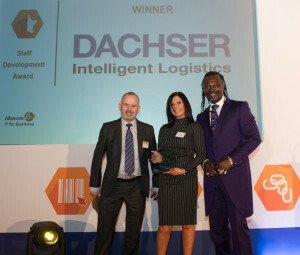 Dachser UK is proud to have been honoured by the British International Freight Association at its annual awards luncheon held in London on the 18th January. The award for Staff Development was sponsored and presented by the Albacore Group at the event hosted by entrepreneur and musician, Levi Roots. As part of this strategy, Dachser UK’s apprenticeship programme has expanded with 14 new apprentices joining the organisation during the second half of 2017 across its four UK branches. The programme provides A-level graduates with an outstanding opportunity to gain a real insight into the logistics industry and forge a successful career. The apprentices are trained, guided and supported throughout the duration of the programme and beyond. Over the past few years, the various apprenticeship schemes on offer at Dachser have evolved in order to continually reflect and address the needs of the developing and changing business. With this in mind, the programme has now been augmented by a specific apprenticeship which addresses the potential needs of a changing European environment as a result of the impending Brexit: ‘Customs and Business Administration’. Dachser UK is part of the German head-quartered global logistics provider. Based in Northampton, with three further branches in Dartford, Rochdale and Bristol, Dachser UK operates a state-of-the-art logistics centre comprising a transit terminal, contract logistics warehouse which can accommodate up to 20,000 racket pallet positions, and an office building, with further contract logistics warehousing on nearby sits. Its continued growth requires an expanding and skilled workforce and Dachser is continually pro-active in developing training programmes for existing staff as well as identifying and recruiting new talent. Managing Director of Dachser UK, Nick Lowe added: “We are very proud of our apprenticeship and training programmes and this award is testament to their success and shows that our staff development approach is recognised across the industry”.